The US economy added a net 195,000 new jobs in June, official figures show. The figure was well above economists’ expectations of 165,000. Revisions to data for April and May added a further 70,000 jobs to previous estimates. 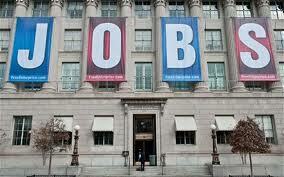 The jobless rate remained steady at 7.6% of the workforce, according to the data from the Bureau of Labor Statistics. The dollar and US bond yields jumped as markets expectations rose that interest rates will start rising in a year. The euro fell three quarters of a cent against the dollar to $1.282, while gold fell almost 3% to $1,214.36 an ounce. The yield on 10-year Treasury bonds rose from 2.5% to 2.68% to their highest level in almost two years. Treasury bonds – the US government’s cost of borrowing – provide an indication of when markets expect the US Federal Reserve to begin raising interest rates, with many analysts now predicting that a move could come as soon as the end of 2014. The news was initially welcomed on Wall Street, where the Dow, S&P 500, and Nasdaq all opened higher. They turned negative mid-morning but regained the higher ground by afternoon trading. “US employment data came out on the strong side of expectations,” wrote Brown, Brothers, & Harriman in a note to clients. Economists paid close attention to the number this month due to concerns that the US Federal Reserve might begin to wind down – or “taper” – its policy of propping up the US economy by buying up debts with newly-created money. Comments by chairman Ben Bernanke in June that indicated that positive economic data in the coming months might lead to tapering of the Fed’s bond buying had roiled markets. If the US economy continues to add jobs at this pace, the unemployment rate should fall from its current 7.6% to 6.5% by the end of 2014. This is the number the Fed has said the US jobs market must reach before it will end its programme of suppressing rates. Leisure and hospitality jobs saw the biggest gains in June, as employers hired workers for the summer season. The data eased fears that the “sequester” – a package of austerity measures that hit the economy in January – would have a negative impact on the jobs market. The government shed 7,000 jobs in June, slightly less than expected. Manufacturing, once a bright spot of the recovery, has continued its recent trend of job losses. This has prompted some to question President Barack Obama’s commitment to the manufacturing sector. “The president laid out a goal of creating a million new manufacturing jobs in his second term. That effort is off to a terrible start,” said Scott Paul, president of the Alliance for American Manufacturing, an industry trade group. The broader rate of unemployment – which includes those who would like a full-time job but can only find part-time work, as well as those who have given up looking for a job – increased slightly in June to 14.3%. While the number of long-term unemployed workers has declined by more than one million over the past year, more than 4.3 million Americans have still been out of work for more than half a year, making up more than a third of the overall unemployed population. With so many still out of work, pressure on wages has been modest, with hourly earnings rising by 0.2% this June, bringing the total rise for the year to 2.2%. That is slightly ahead of the US inflation rate, with consumer prices having risen by just 1.4% in June from a year earlier. The slow rate of wage growth and the large supply of willing workers mean that, while the American recovery continues to pick up steam, pressure on prices continues to be modest.